In the case of Jim Collier, I met him before I saw his paintings. I confessed that I was not aware that Jim’s paintings were for sale until I came to Galerie Strous. An exhibition for a painter is like a concert for a musician. We are for hire. Our CDs are for sale. For the artist, an exhibition also brings opportunities for future commissions. At the “Muziek en Amuses” house concert of 17th April 2010, I was invited to the opening of a new solo exhibition of Jim Collier, an American artist based in Amsterdam. The invitation postcard was a beautiful reproduction of Jim Collier‘s “Twelve Houses, Amsterdam 50 x 105 cm” on one side. I posted it onto my refrigerator, as a reminder to visit the Galerie Strous on the Prinsengracht in the month of May. As much as we wanted to, neither Robert nor I could make it to the opening on Sunday 25th April, for Robert was giving a solo performance in Voorschoten. A gallery opening such as this was bound to attract interesting people, as I discovered from the photos on Facebook the next day. By “interesting,” I mean people with interesting lives and perspectives — people I find fascinating to engage in conversation — people I could admire and learn from. I have met some of my most interesting friends at gallery openings and private viewings: the artist Yousif Naser and the late architect/ceramist Ayyub Malik, to name a few. What these people have in common is originality of thought. They are creators with their own philosophies and opinions. I like the buzz I get from talking to them. 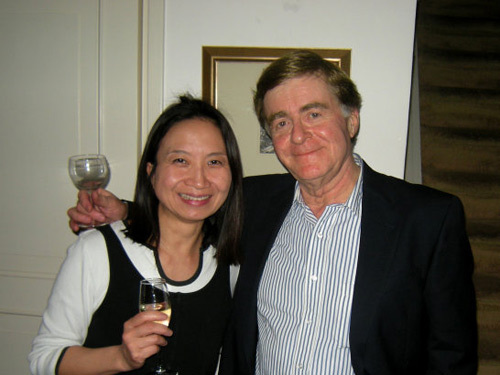 In the case of Jim Collier, I met him before I saw his paintings. Only upon my second visit to his apartment in Amsterdam, did I realise that the huge close-ups of the Leaning Tower of Pisa and the Duomo of Florence were not photographs but oil paintings. Jim’s art is so real that one can’t help but wonder where the brush stroke begins and ends. Inside Jim’s art studio in an 17th century canal house on Amsterdam’s famous Keizersgracht is a grand piano. How often do you find a grand piano in an art studio? Or an artist who can play the piano? 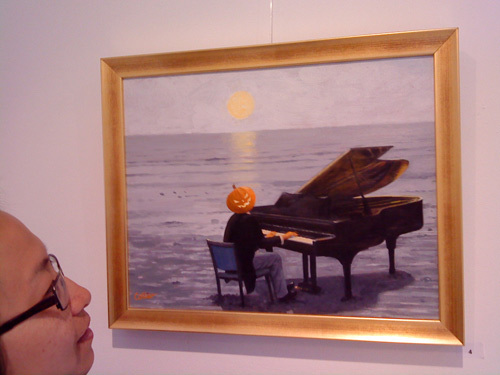 Below, I believe, is a self-portrait of the artist (born on Halloween) at the piano. As a musician, I would love to see more paintings of musical instruments. 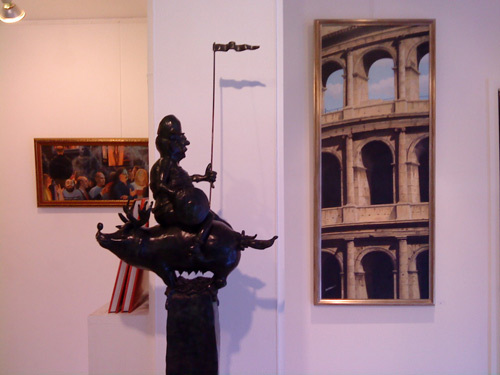 On Friday 28th May, I finally got the chance to visit Galerie Strous to see Jim Collier’s paintings of Italy, Amsterdam, and flying elephants. It is quite a different experience to see an artist’s work previously seen in his home in the public space of a gallery. In Jim’s home, the paintings were part of the interior decoration. It was a seamless path from the front door to the kitchen — not a gallery where you would pause at each painting. 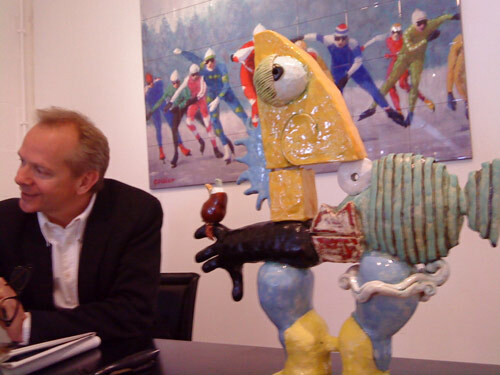 At the gallery on Prinsengracht, the paintings were featured on white space with the occasional scupture by the gallery owner Leon Strous. The environment changes the context of the viewing experience. Although the gallery was a public space, the presence of the owner offering a glass of rosé to the visitors made it personal. I should say that Galerie Strous is a private gallery, but the space was publically available to those that entered it on days that it’s open or by appointment. “You enjoy meeting people who come here, don’t you?” I asked Leon. I can’t imagine all visitors receiving VIP treatment like me and Carole Anne. We sat across from Leon at his desk and discussed cultural economics. What kind of people buy art? What motivates people to own art? Can live music attract people to visit an art gallery? I confessed that I was not aware that Jim’s paintings were for sale until I came to Galerie Strous. An exhibition for a painter is like a concert for a musician. We are for hire. Our CDs are for sale. For the artist, an exhibition also brings opportunities for future commissions. I was hoping to meet the artist. Perhaps this blog post will take me there. Dr. Collier was my Art History professor at Auburn University from 1977-80. He was quite erudite and I enjoyed his lectures immensely. He was far more urbane that the average professor at Auburn, and nice looking. He seemed somewhat out-of-place there and it doesn’t surprise me that he now lives in The Netherlands. His thorough knowledge of the Italian Renaissance and Northern Renaissance artists was impressive and it seems appropriate that he now paints European landscapes. Tell him that I said hi, won’t you? Super info it is really. My girlfriend has been waiting for this update.